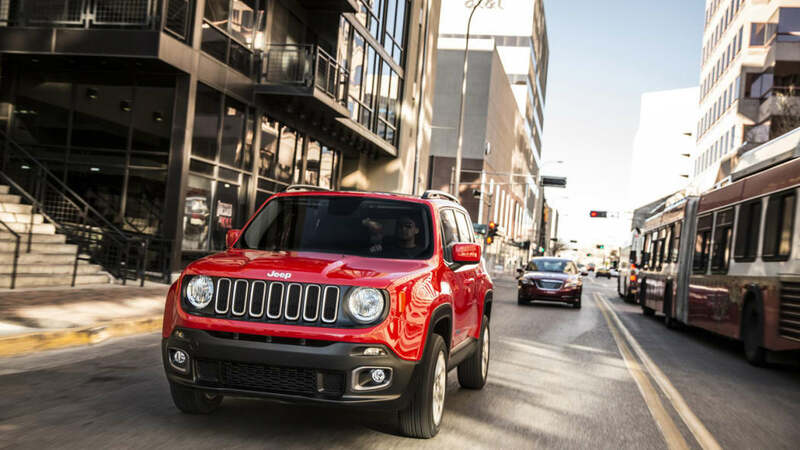 It's no secret that the midsize crossover segment is one of the most hotly contested battlegrounds in the automotive industry. Long have vehicles like the Ford Escape, Honda CR-V and Toyota RAV4 duked it out for those ever illusive consumer dollars. For many customers, though, even something like a Nissan Rogue is too big, whether in terms of price, fuel economy or just plain size. For those customers, a growing market segment seems poised to fulfill their needs. Compact crossovers and tall wagons like the Nissan Juke and Kia Soul offer the high-riding driving experience with all the utility that comes from their two-box layout. It's an underrepresented segment among manufacturers, with big names like Toyota, Ford, General Motors and Honda lacking a true competitor. 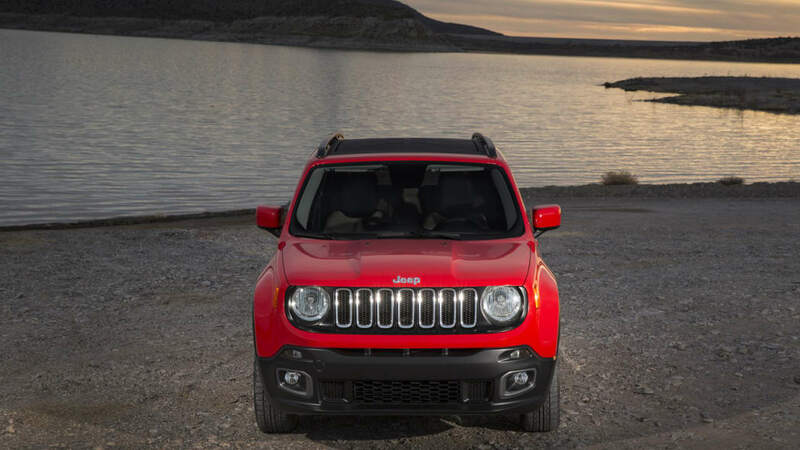 To capitalize on this growing class, Chrysler's Jeep brand has readied this: the Renegade. That's right. Not Jeepster – Renegade. 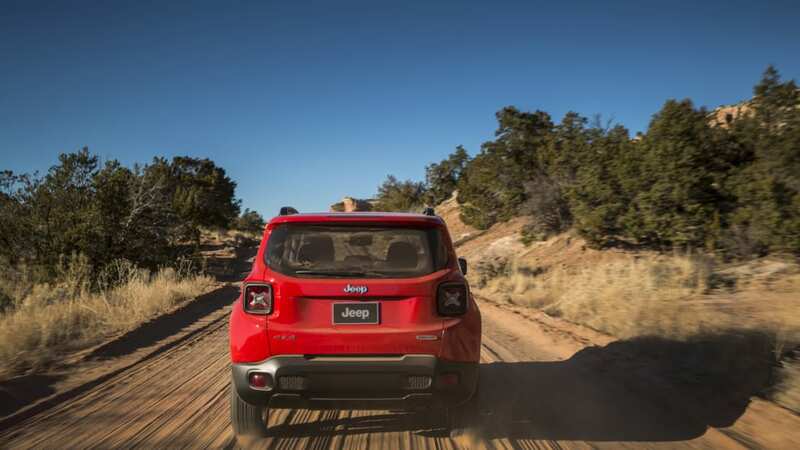 This diminutive off-roader, which rides on Fiat Chrysler's new small-wide 4x4 architecture, represents Jeep's first foray into the subcompact CUV segment as we know it, and it's making its official debut this week, on the floor of the 2014 Geneva Motor Show. 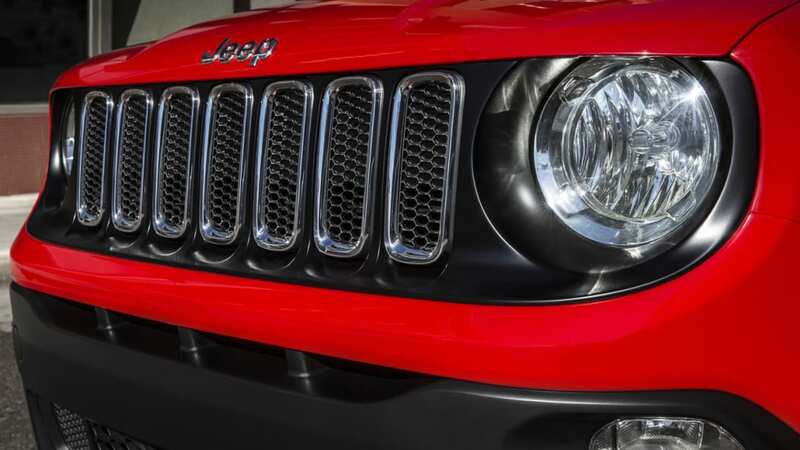 Join us as we take a close look at one of Jeep's most important products in some time. 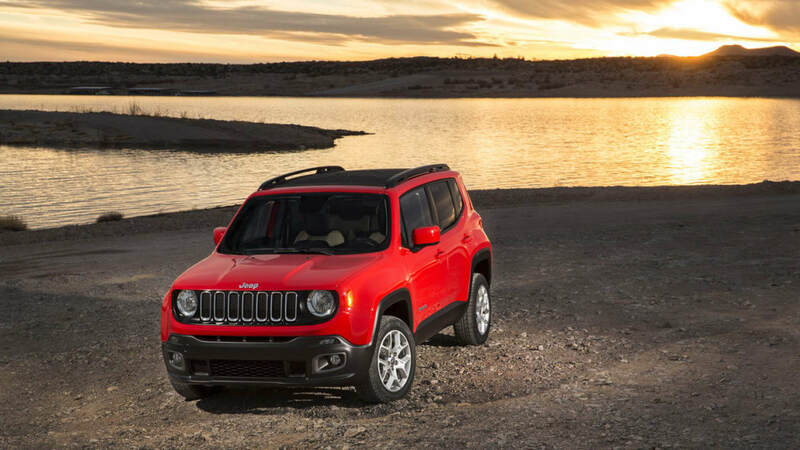 Fiat-Chrysler's renewed focus on design has been central to the past few products it's launched, such as the Cherokee and 200. 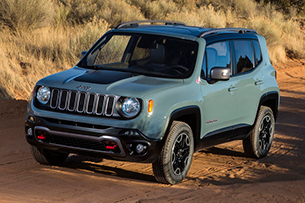 That's no different with the Renegade, but where the 200 goes for elegant class and the Cherokee tries to look like an off-roader from another planet, this new little darling has a rough-and-tumble cuteness to its looks. It's pretty darn adorable. 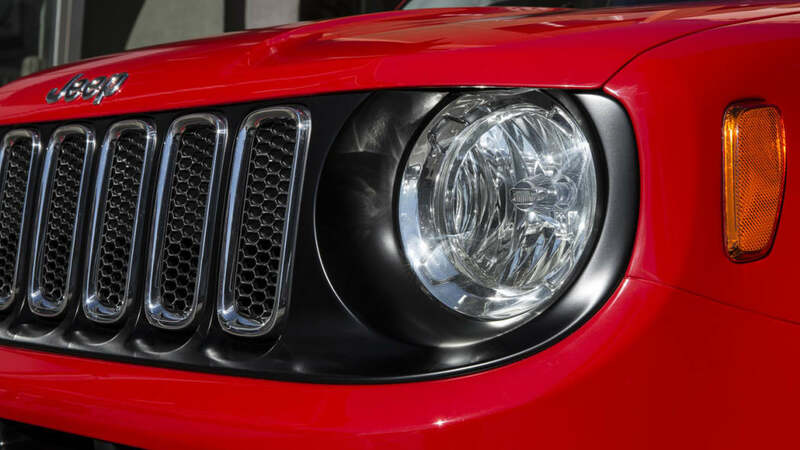 Jeep better get used to hearing that, as it's an apt descriptor for the Renegade's exaggerated features. 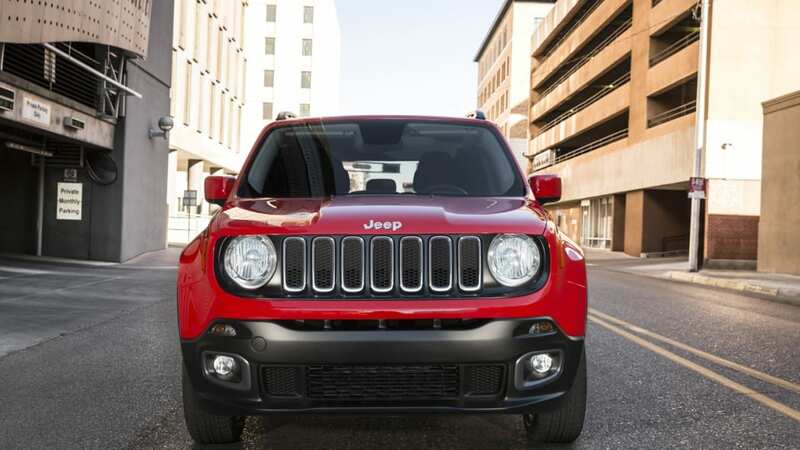 The trademark seven-slat grille and circular headlights are wrapped in a rounded, blacked-out grille that is immediately identifiable as a Jeep and presents the small CUV as more of a baby Wrangler than a smaller Cherokee. We're digging the long, creased hood, as well. It's more of a baby Wrangler than a smaller Cherokee. 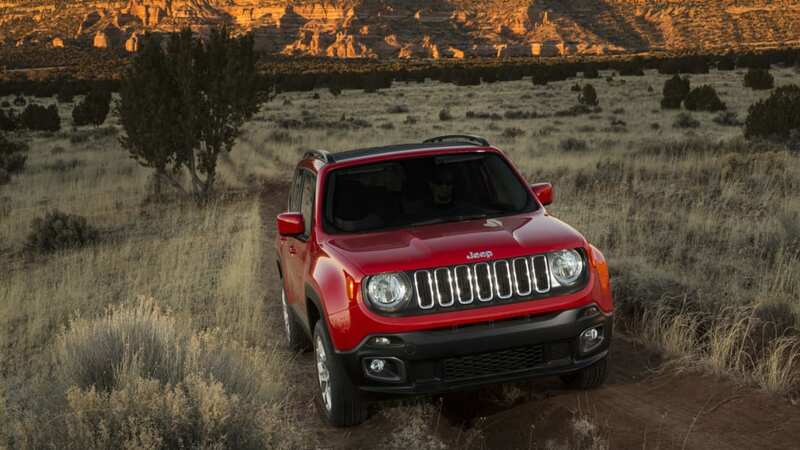 The Renegade's wheel arches are aggressively flared, looking more hot hatch than off-roader. The greenhouse, meanwhile, bears a very strong resemblance to that of the stillborn Dodge Hornet Concept from a few years back, with a similar shape, including the upward surge of the beltline just before the C pillar. The tiny rear overhang and spoiler also remind us of Hornet. The long, flat hood meanwhile, still allows it to retain that classic, two-box Jeep shape. 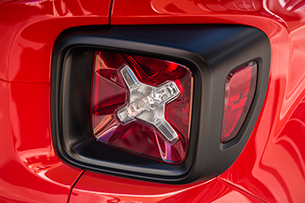 Distinctive square taillights that feature an "X" accent meant to recall a military jerry can finish off the rear of the Renegade. 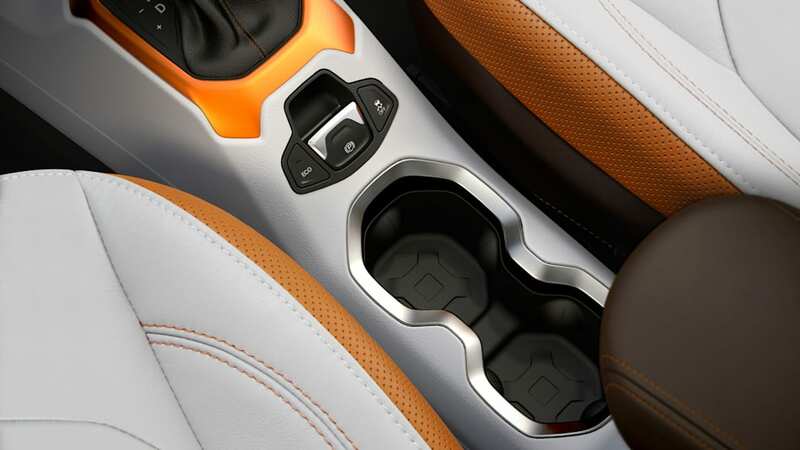 Jeep is using a design language for the Renegade's interior that it calls "Tek-Tonic." It aims to intersect "soft and tactile forms with rugged and functional details." We just think it's a nice bit of design work. 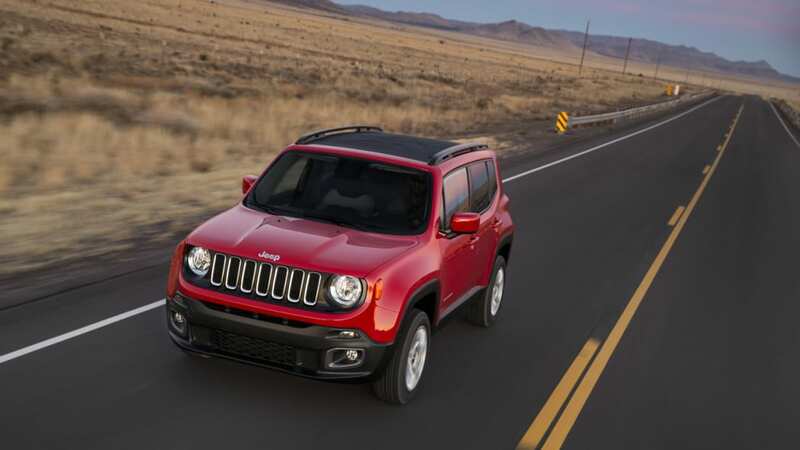 The cabin shares a resemblance to the bigger Cherokee while integrating some of the Wrangler, notably the grab handle integrated into the passenger-side dash. 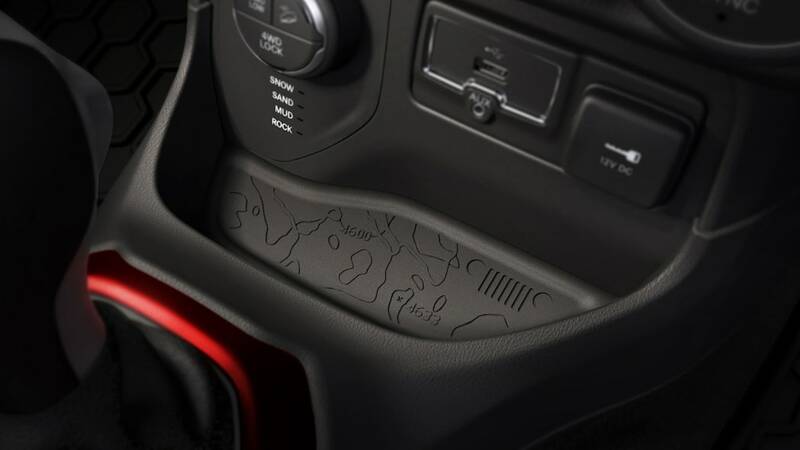 Jeep has continued its clever use of Easter Eggs in this interior, embossing a topographical map of Moab, UT, a popular Jeep destination, in a change tray in the center stack. While we like the aesthetic of the display, based on the pictures, but we have some concerns about the material quality. 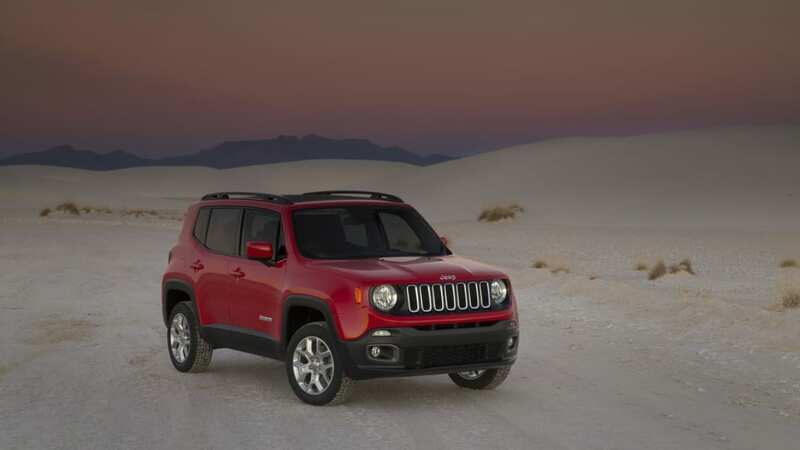 Of course, we'll need to wait to get our hands on a Renegade to see how good or bad it really is. 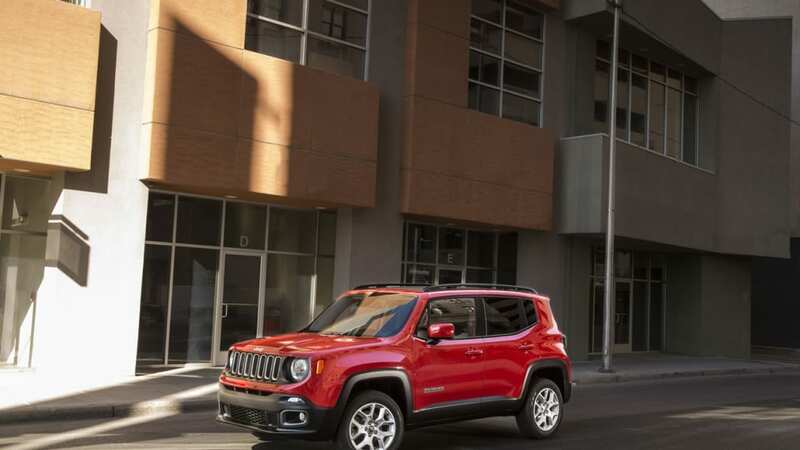 When the Renegade arrives, its cabin will boast four interior schemes. Trespass Black is a monotone theme that features Moroccan sun finishes and contrast stitching. The other monotone design, Trailhawk Black, is shown in the gallery, and features those distinctive, anodized Ruby Red finishes. There's a pair of two-tone color schemes as well, with Sand Surfing Black and Warm Sand, which features satin chrome accents, and Free Falling Bark Brown and Ski Gray (also shown in the gallery), which includes orange details. There's 118.6 cubic feet of interior volume, which is considerably more than its competitors. 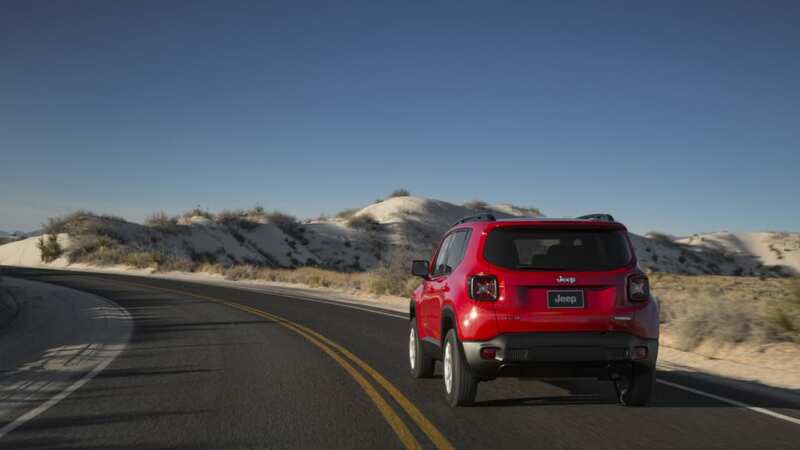 In terms of overall size, meanwhile, the Renegade rides on a 101.2-inch wheelbase. That's identical to a Kia Soul, but the Jeep is 3.6 inches longer and 3.5 inches taller. It's also larger than the Nissan Juke in virtually every dimension. In the cabin, there's 118.6 cubic feet of interior volume, according to the EPA, which is considerably more than either of the competitors. 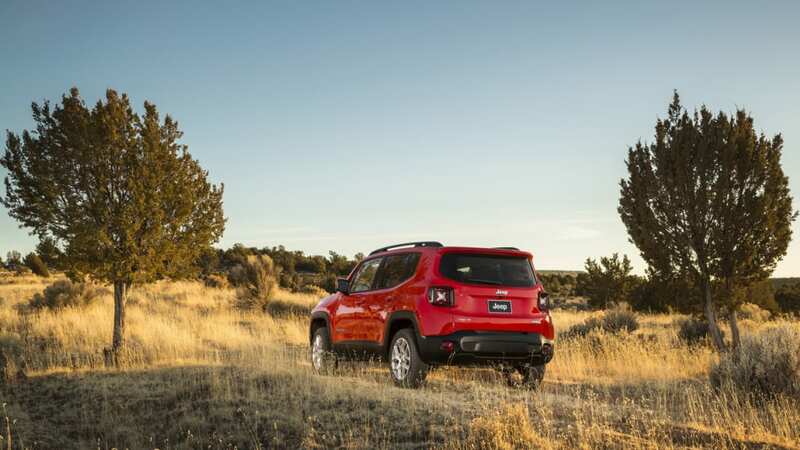 All that volume makes the Renegade a versatile little thing, with 12.4 cubic feet of storage when the second row of seats are up, and 30.7 cubic feet when they're folded flat. 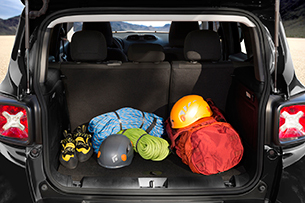 For added versatility, owners will have the option of rear seats with either a 60/40 split or 40/20/40 with a cargo pass-through. 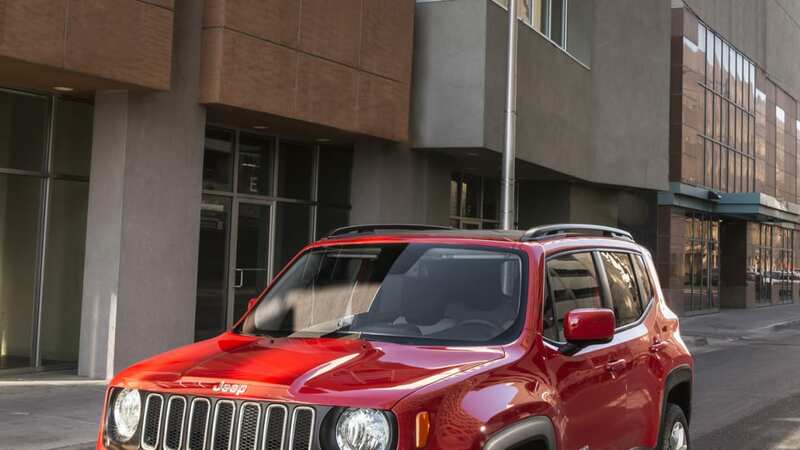 If even more space is needed, Jeep claims a five-foot ladder can be accommodated thanks to a fold-forward front seat. Jeep shoehorned a fair amount of technology into this cabin. UConnect is available in two new form factors - a 5- or 6.5-inch touchscreen display. While we're bummed that the big 8.4-inch display is getting left out, we imagine it'd look like a bit much in the Renegade's dash. The other big-ticket tech feature is Chrysler's seven-inch TFT display in the instrument cluster, something we've raved about for its clarity and attractive presentation of information. It replaces a standard, monochrome 3.5-inch display. A heated steering wheel, heated seats and other, more common options are also available. 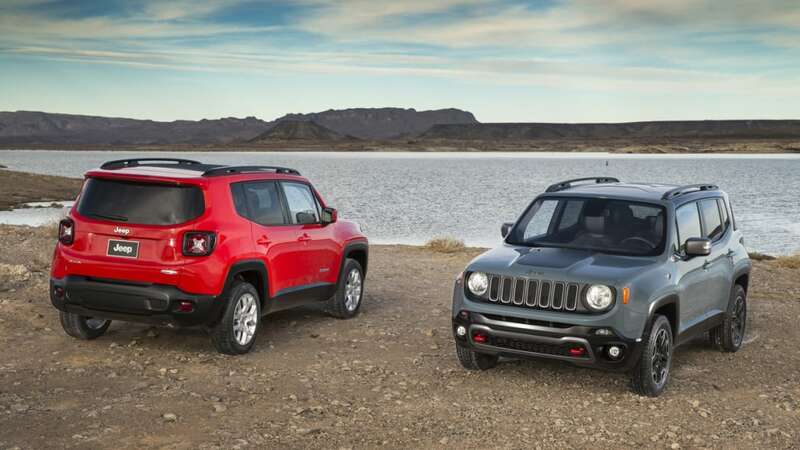 Jeep has developed 16 different powertrain combinations for the global Renegade. One of the more exciting optional features on the Renegade is its unique roof system. 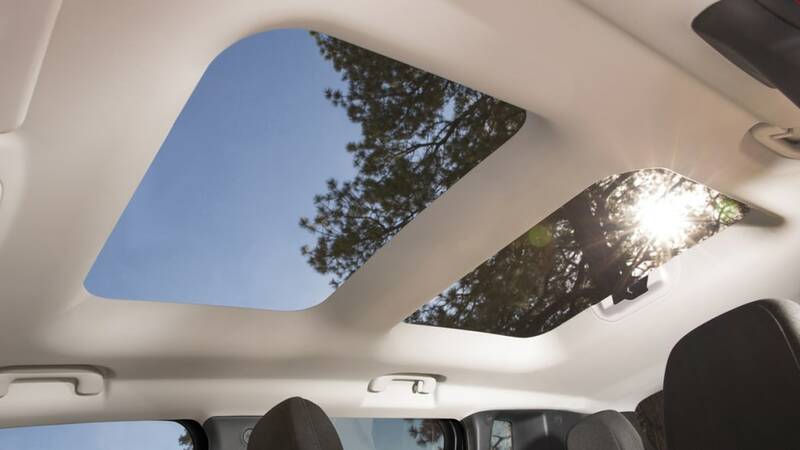 Of course, a standard fixed roof is available, but for those that desire a bit more light, this little Jeep has taken a page out of the Wrangler's playbook, with something called My Sky. 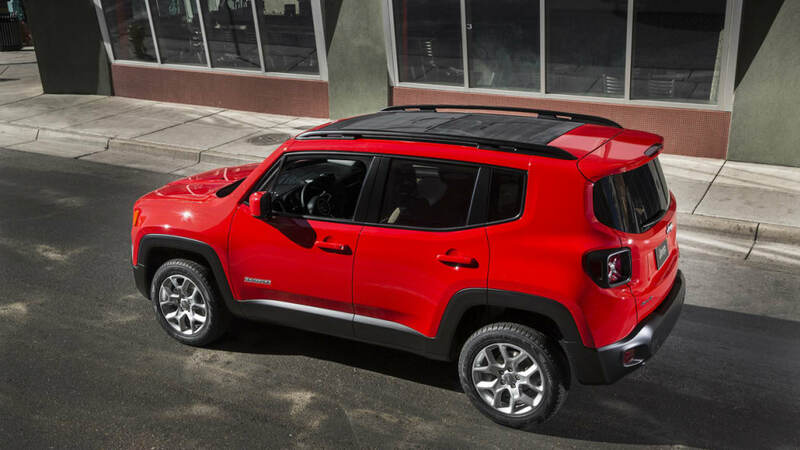 The gist is, like the Wrangler, two roof panels can be removed and stowed in the Renegade's trunk, opening the cabin from the back of the second row forward. The panels are made of a lightweight fiberglass-polyurethane material and are available as a fixed item or with a power tilt/slide feature. For those that want the look of My Sky without the actual panels, the roof can also be painted black. Because this Jeep is destined for markets all over the globe, the automaker has developed 16 different powertrain combos. Economies of scale be damned, apparently. There will be four different gas engines, utilizing Fiat's MultiAir technology, and two MultiJet II diesel mills (which won't be coming to the US). Stop-start technology will be available (again, not in the US), as well as a segment-first nine speed automatic, a dual-clutch transmission and a pair of manual transmissions, with five and six gears. For simplicity's sake, let's just talk about the stuff destined for the US. Just two of the six engines available will be coming to America, and we're quite familiar with both of them. Fiat's 1.4-liter, turbocharged four-cylinder from the 500L is the first, offering up 160 horsepower and 184 pound-feet of torque. 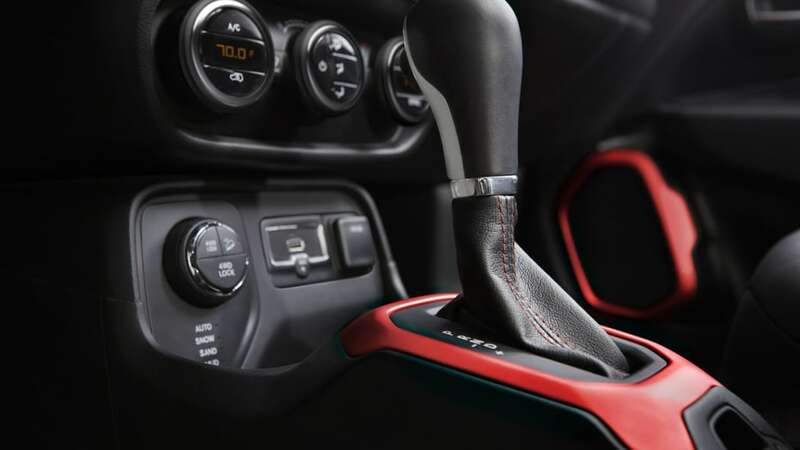 It will be mated to a six-speed manual transmission that sends power to the front wheels. We don't want to get our hopes up, but if the information provided by Jeep is correct, the turbo/6MT combo will also be available with a Jeep four-wheel-drive system. This sounds excellent. Just two of the six engines available will be coming to America, and we're quite familiar with both of them. The other US-spec engine is the 2.4-liter Tigershark four-cylinder from the Dodge Dart, Chrysler 200 and a spate of other recent products. Good for 184 hp and 177 lb-ft of torque, the Tigershark will be mated to a nine-speed auto, with standard two-wheel drive and optional four-wheel drive. 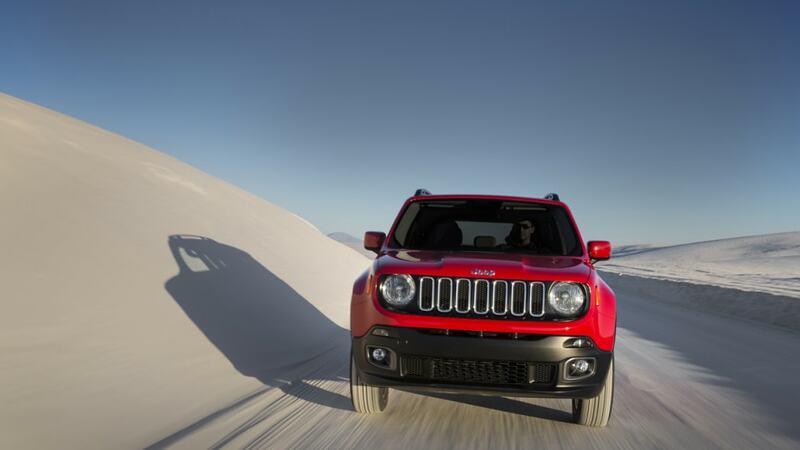 Being a Jeep, we're obligated to talk a bit about those all-wheel drive systems. 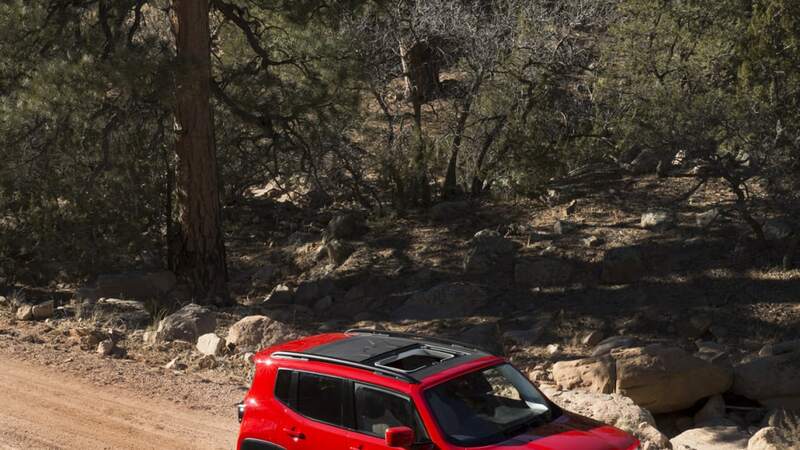 Jeep Active Drive uses a rear-axle and power transfer unit disconnect to improve economy, but still deliver torque to all four wheels when needed. 100 percent of engine torque can be shuffled to any one wheel. 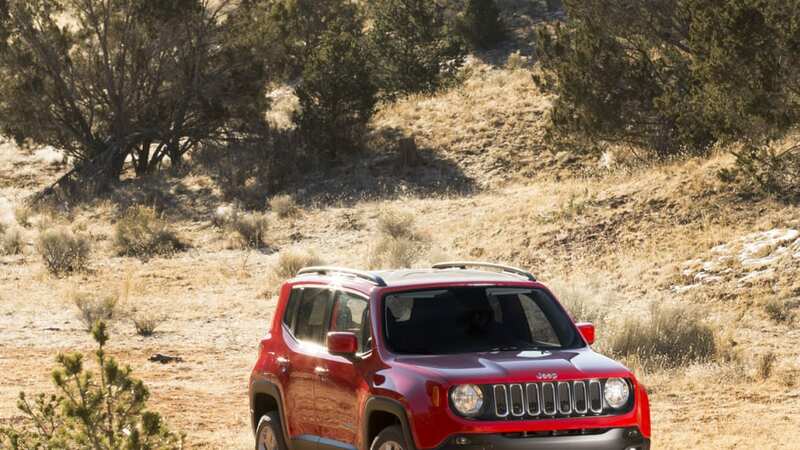 The second AWD system is called Jeep Active Drive Low, and as you might guess, it features a 20-to-one crawl ratio. 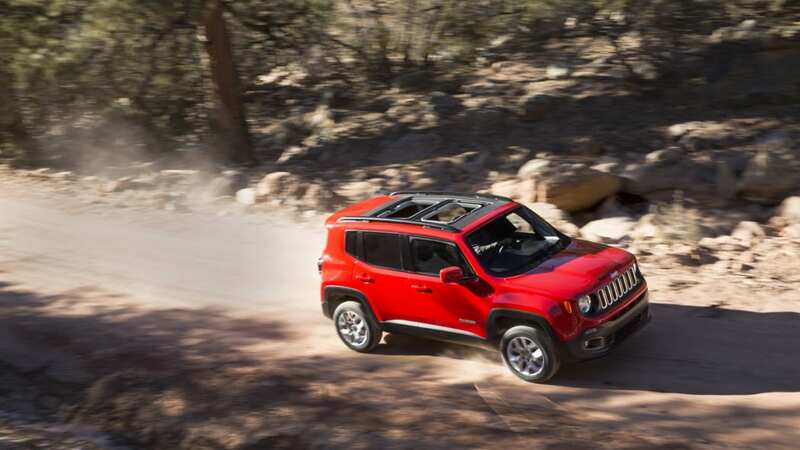 That's enough for it to boast Jeep's coveted "Trail Rated" badge. 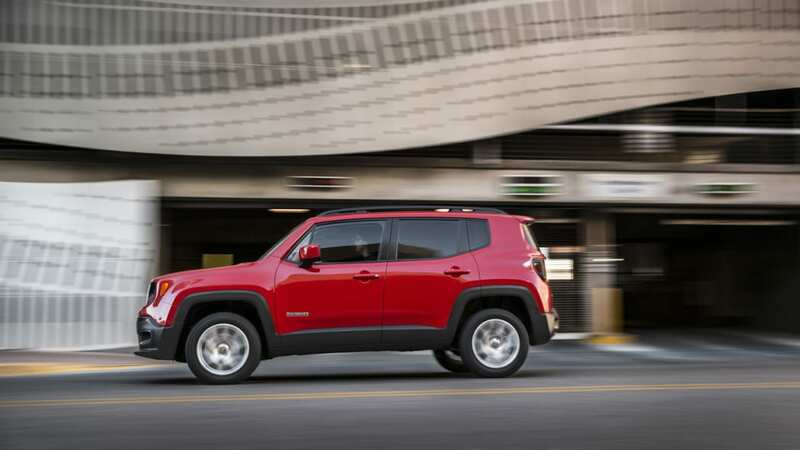 Both systems will be available with Jeep's Selec-Terrain system, which optimizes the vehicle in four (or five, if you have Active Drive Low) settings. 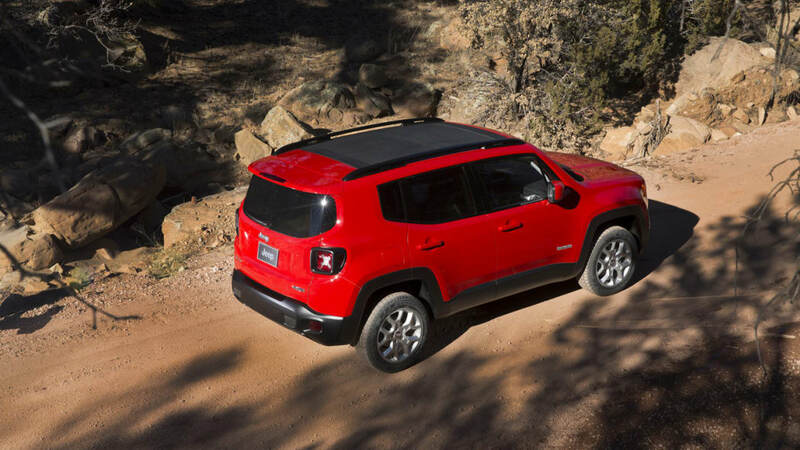 Auto, Snow, Sport and Sand/Mud are available on all four-wheel-drive Jeeps, while the off-road-ready Trailhawk will boast a Rock mode. Hill-descent control and Selec-Speed Control come standard. The Renegade rides on a MacPherson-type front suspension and a rear cradle that's been fitted with a Chapman suspension design. 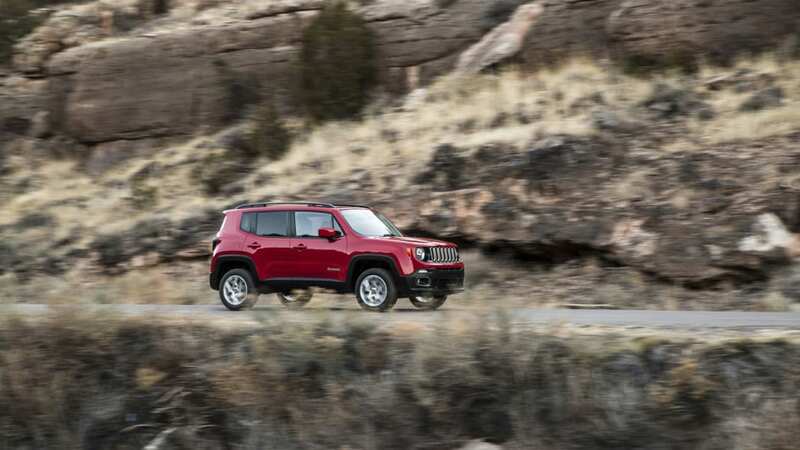 This combination, according to Jeep, should deliver up to 6.7 inches of articulation in the front suspension and 8.1 inches in the rear, without compromising handling prowess. 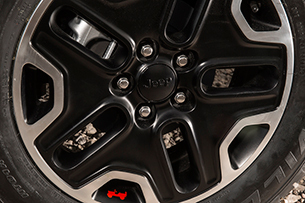 Koni frequency selective dampers come standard and are a first for Jeep. Based on our experience with the Koni FSDs on the Fiat 500L, it's a fair bet that the Jeep's ride will be pretty comfy relative to the competition. It's a fair bet that the Jeep's ride will be pretty comfy relative to the competition. Steering duties will be handled by an electric power-steering rack. While these systems are getting better, the improvement in fuel economy provided often means a sacrifice in feedback. We'll reserve judgment in the case of the Renegade, though. In the case of the small Jeep, the EPS system should deliver a three-percent improvement in fuel economy. 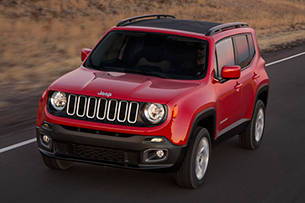 Crash test ratings are, obviously, not available for the Renegade just yet, but with seven standard airbags (seat-mounted and side-curtain airbags come standard) and all that high-strength steel, we're expecting the baby Jeep to do well. Blind-spot monitoring, forward collision warning and lane departure warning are also available as optional items. Normally, this would be the point that we'd talk about trim levels and prices. 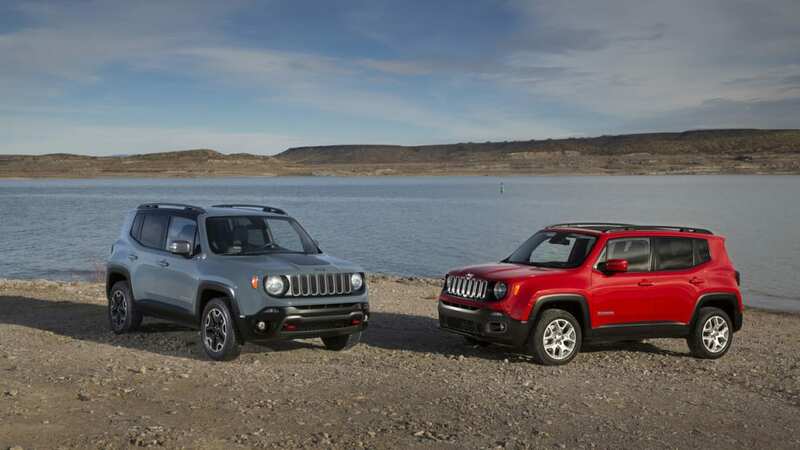 We can confirm that the Renegade will be available in base Sport, Latitude (the red model pictured), Limited and Trailhawk (the blue one), although we don't have breakdowns of standard equipment for each trim. We expect that info, along with pricing, to be released closer to the on-sale date. 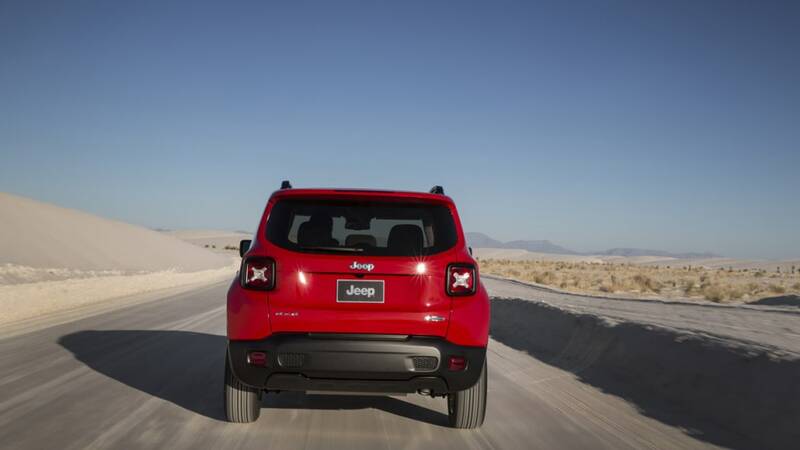 We're quite optimistic about Jeep's smallest model. 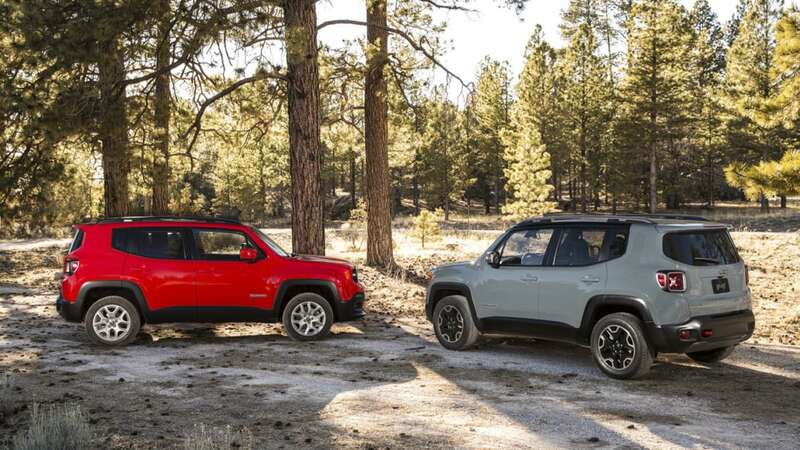 Based on what we've learned about the Renegade so far, we're quite optimistic about Jeep's smallest model. 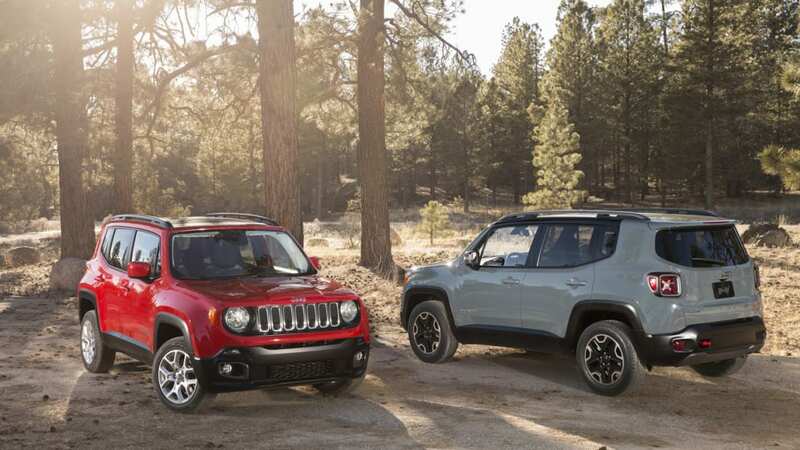 From our perspective, it seems like Jeep strived to avoid building a smaller Cherokee and instead opted for a smaller, more affordable Wrangler. 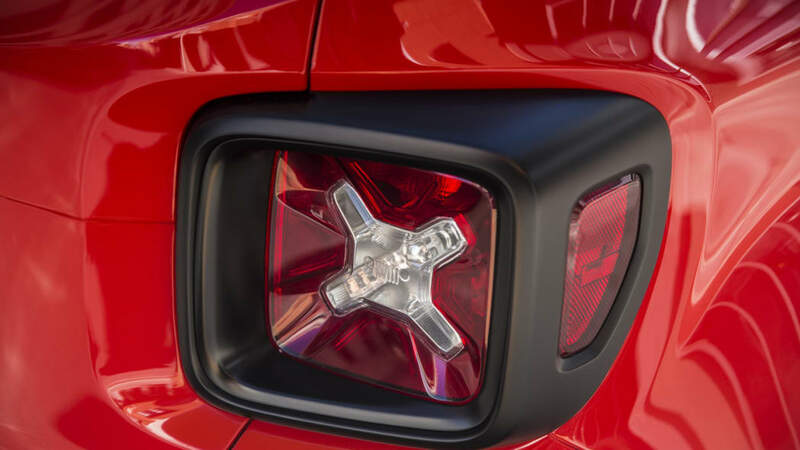 Going for an entry model that really tried to adhere to Jeep traditions strikes us as a clever way to sell the brand to a new generation of customers. Whether it works or not remains to be seen, though. 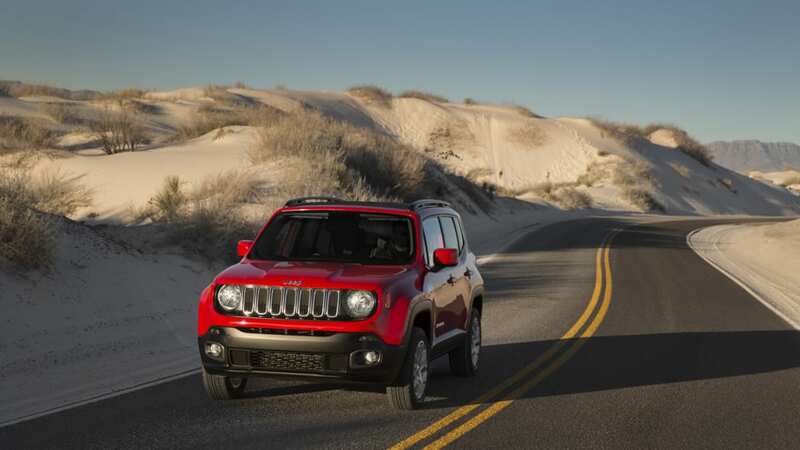 The 2015 Jeep Renegade will be built at Fiat's Malfi, Italy factory while its powertrains will be sourced from the US, Italy and Brazil. US availability will be announced at a later date. 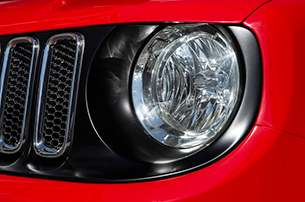 Stay tuned for more on Jeep's newest model from the floor of the 2014 Geneva Motor Show. 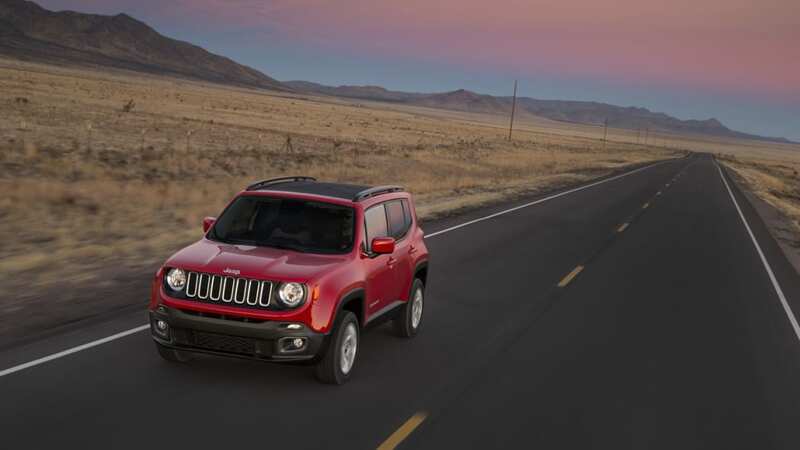 The all-new 2015 Jeep® Renegade expands the brand's global vehicle lineup, entering the growing small SUV segment, while staying true to the adventurous lifestyle Jeep is known for. 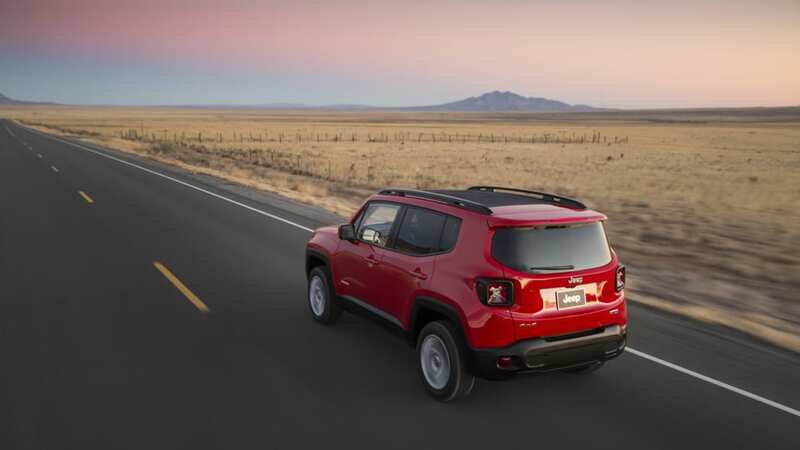 Renegade delivers a unique combination of best-in-class off-road capability, open-air freedom and convenience, a segment-first nine-speed automatic transmission that contributes to outstanding on- road and off-road driving dynamics, fuel-efficient engines, world-class refinement, and a host of innovative safety and advanced technology offerings. The result is an efficient vehicle created to attract youthful and adventurous customers around the world to the Jeep brand. 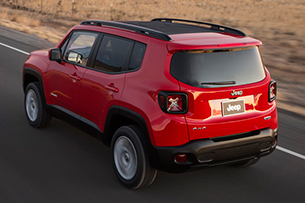 The all-new 2015 Jeep Renegade expands the brand's product portfolio and targets the rapidly expanding small SUV segment around the globe with benchmark levels of efficiency and driving dynamics, while at the same time delivering best-in-class 4x4 capability that customers expect from Jeep,‖ said Mike Manley, President and CEO - Jeep Brand, Chrysler Group LLC. 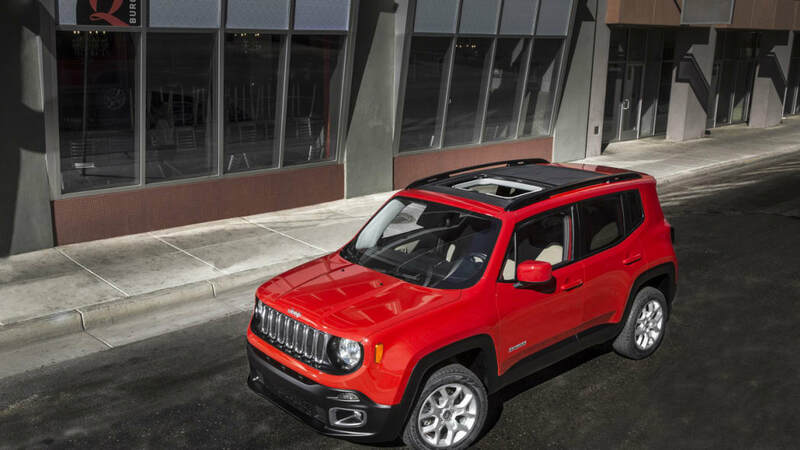 ―Renegade symbolizes the brand's renowned American design, ingenuity and innovation, marking the Jeep brand's first entry into the small SUV segment in more than 100 markets around the globe. 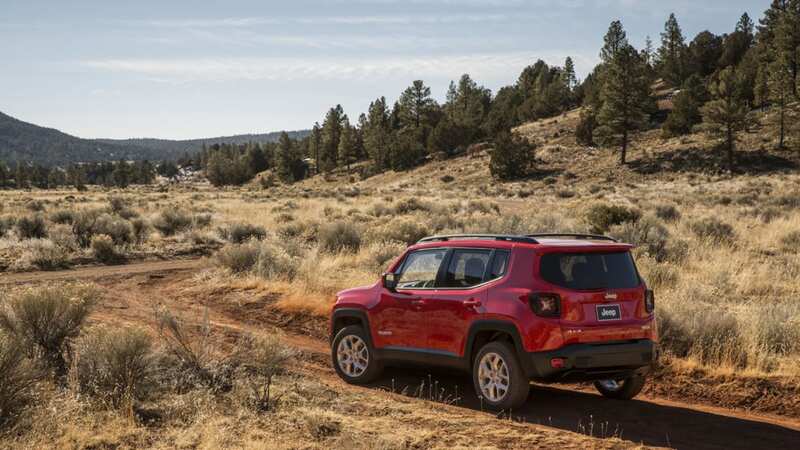 Leveraging 4x4 technology from the all-new Jeep Cherokee, the all-new 2015 Jeep Renegade offers two of the most advanced and intelligent 4x4 systems in its class, all to deliver best-in-class off-road capability. Both systems can provide up to 100 percent of the engine's available torque to the ground, through any wheel, for optimal grip. 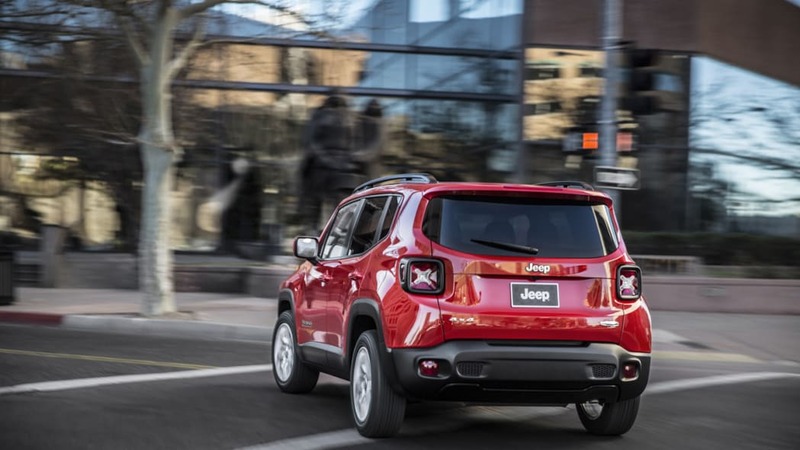 Innovation is also at the forefront of any new Jeep vehicle, and the Renegade is the first small SUV to feature a disconnecting rear axle and power take-off unit (PTU) – all to provide Jeep Renegade 4x4 models with enhanced fuel economy. The system instantly engages when 4x4 traction is needed. 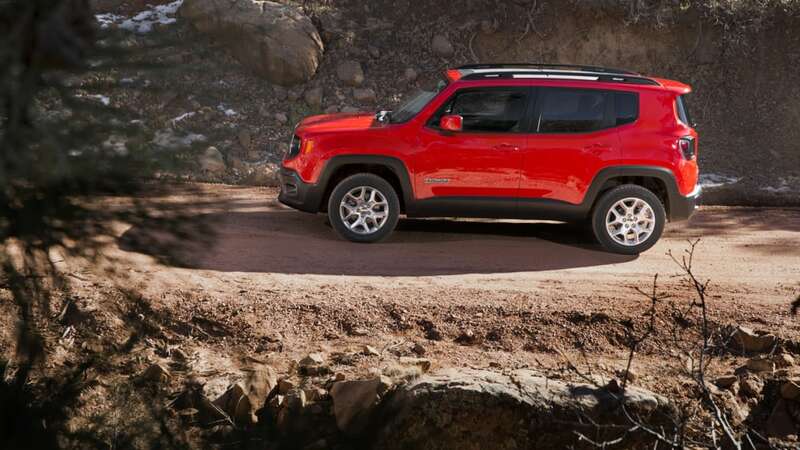 From the start, Jeep designers knew the Renegade would need to deliver best-in-class off-road capability with city-sized proportions that exuded the brand's rugged style while at the same time enhancing versatility, maneuverability and style. 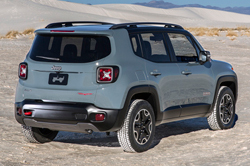 Additionally designers were tasked to create an all- new SUV that would symbolize the brand's renowned American design and ingenuity, as it would mark the Jeep brand's first entry into the small SUV segment in more than 100 markets around the globe. 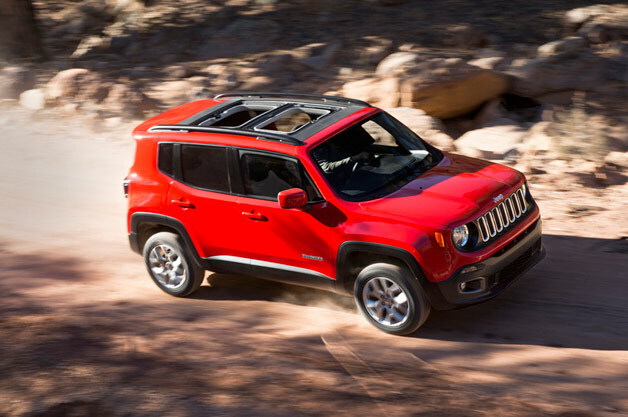 Last, Renegade had to offer the open-air freedom that dates back to its 1941 roots with the Willys MB Jeep. 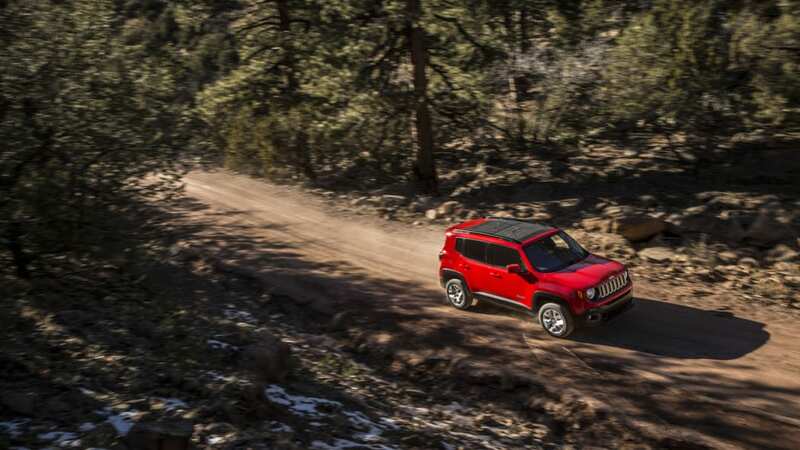 The result is the all-new 2015 Renegade, a vehicle that builds on the Jeep Wrangler's powerful stance, and features fresh new styling with rugged body forms and aggressive proportions that enable best-in-class approach and departure angles purposely designed to deliver best-in-class off- road capability. And for segment-exclusive panoramic views, two available My Sky open-air roof panel systems conveniently stow to provide passengers open-air freedom with ease. 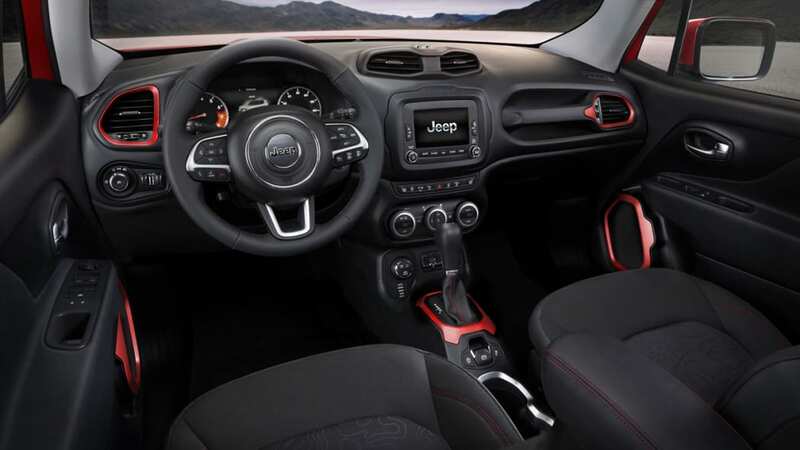 The all-new Jeep Renegade interior features a rugged and energetic appearance that builds upon Jeep's legendary brand heritage. Its precisely crafted detail, innovative and high-quality color and material appointments, state-of-the-art technology, and clever storage features draw inspiration from contemporary extreme sports gear and lifestyles. 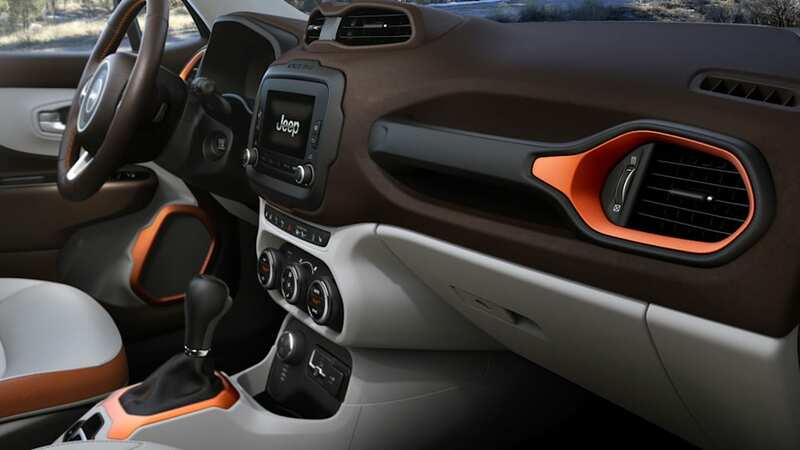 The interior of the all-new 2015 Jeep Renegade has a distinctive form language which Jeep designers have titled ―Tek-Tonic.‖ This new design theme is defined by the intersections of soft and tactile forms with rugged and functional details. 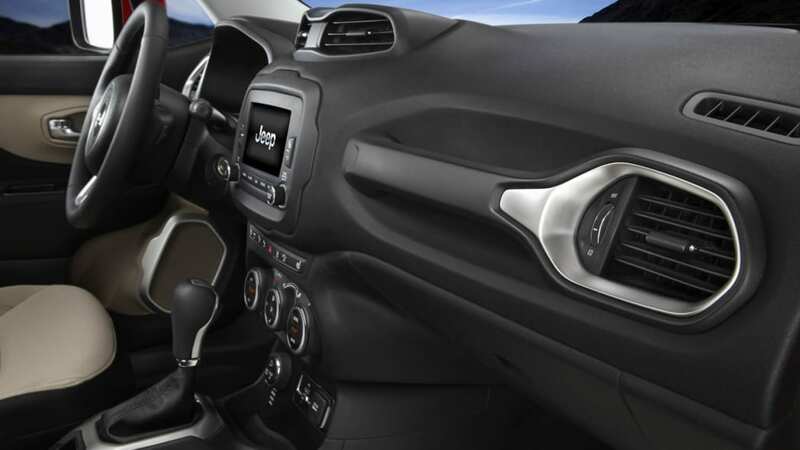 Major surfaces such as the sculpted soft-touch instrument panel are intersected with bold functional elements like the passenger grab handle – indispensable for off-road adventures and borrowed from its big brother, the legendary Jeep Wrangler. Unique ―protective clamp fasteners,‖ anodized design accents and inspired colors are derived from extreme sports equipment, while the newly familiar ―X‖ shapes inspired by its roof and tail lamps add to Renegade's Tek-Tonic interior look. 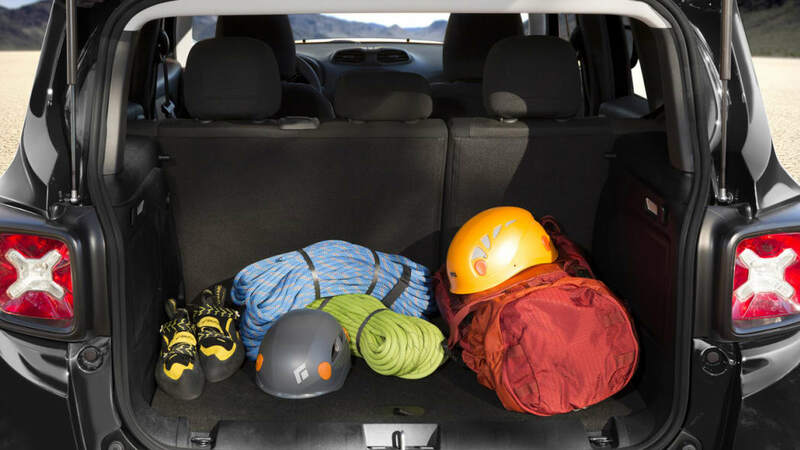 And to make sure all of the needed passenger gear fits, the Renegade is designed with an efficient and flexible interior package that includes a removable, reversible and height-adjustable cargo floor panel and fold-forward front-passenger seat. Keeping the tradition of the legendary 1941 Willys MB Jeep, the all-new 2015 Renegade offers open-air freedom with two available My Sky open-air roof systems. 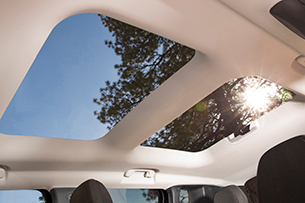 With a manual removable, or removable with premium power tilt/slide feature, the segment-exclusive My Sky roof-panel systems quickly bring the outdoors inside. Designed for convenience, the honeycomb fiberglass polyurethane roof panels are lightweight and stow neatly in the rear cargo area. For added design detail, both My Sky roof systems feature a debossed ―X‖ stamped into the roof that exude strength and play on the brand's utilitarian history. 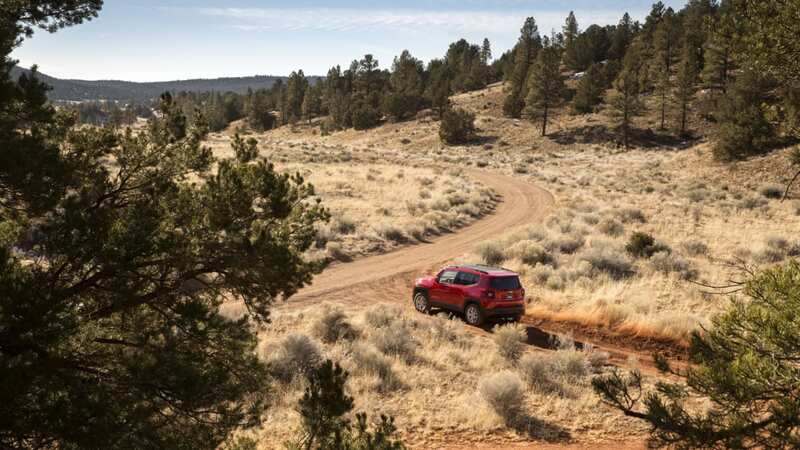 With its fully independent suspension capable of up to 205 mm (8.1 inches) of wheel articulation and 220 mm (8.7 inches) of ground clearance (Trailhawk), Renegade raises the bar in the small SUV segment with best-in-class off-road capability. 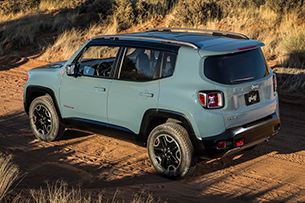 Extensive use of advanced steels, composites and advanced computer-impact simulations enable the all-new 2015 Renegade's architecture to deliver world-class torsional stiffness and Jeep brand's durability required for Trail Rated adventures. 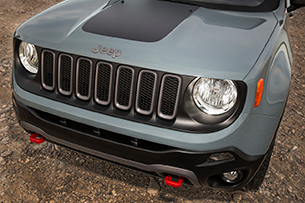 The all-new Renegade is the first Jeep to integrate Koni's frequency selective damping (FSD) front and rear strut system. 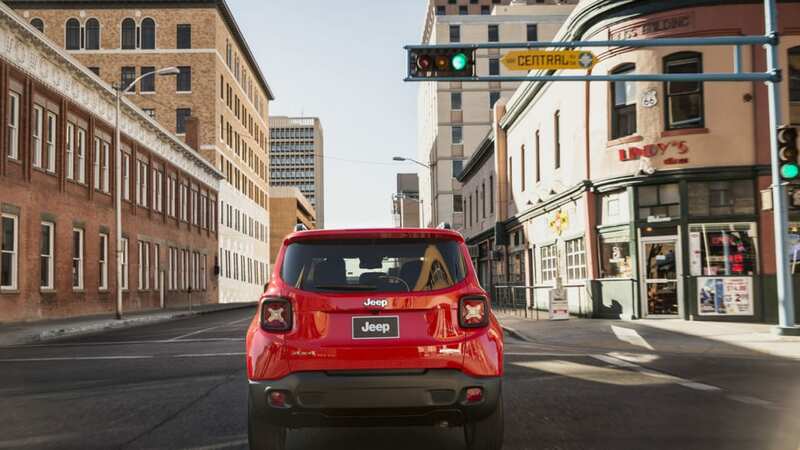 This damping system enables the Jeep Renegade to deliver world-class road-holding and handling characteristics. 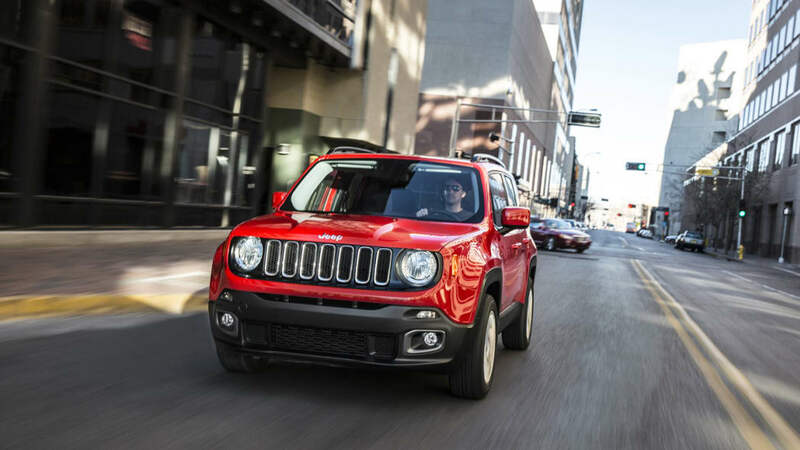 Like the new Jeep Cherokee, the all-new 2015 Jeep Renegade has raised the bar - this time in the small SUV class - with the first available nine-speed automatic transmission. When paired with either the 2.0-liter MultiJet II diesel engine, or 2.4-liter MultiAir2 gas engine, the nine-speed transmission delivers numerous benefits customers will appreciate, including aggressive launches, smooth power delivery at highway speeds and improved fuel efficiency versus a six-speed automatic transmission. 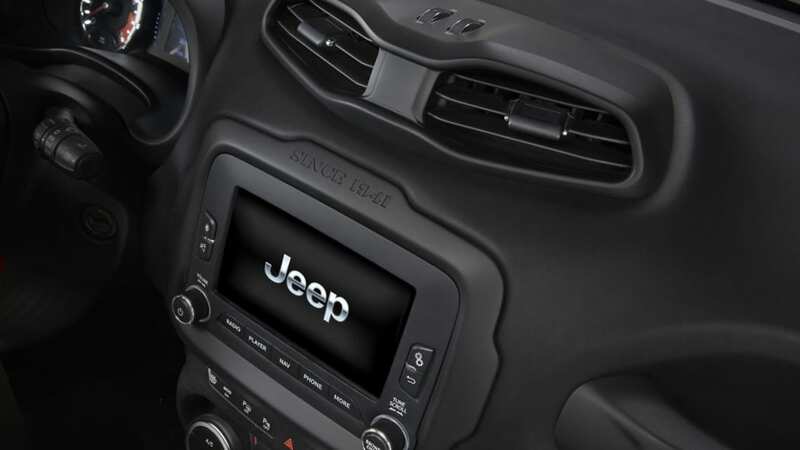 The all-new 2015 Jeep Renegade offers technology features once found only in upper-segment vehicles, and makes them attainable to customers in the growing small SUV segment – including award-winning Uconnect Access, Uconnect touchscreens and the segment's largest full-color instrument cluster. 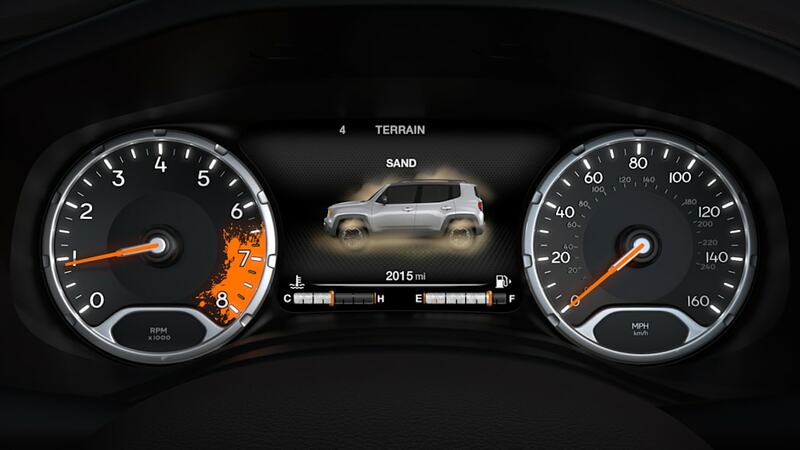 - Segment's largest full-color instrument cluster display: Filling the Jeep Renegade's gauge cluster in front of the driver is an available 7-inch, full-color, premium multiview display, featuring a reconfigurable function that enables drivers to personalize information inside the instrument cluster. The information display is designed to visually communicate information, using graphics and text, quickly and easily. 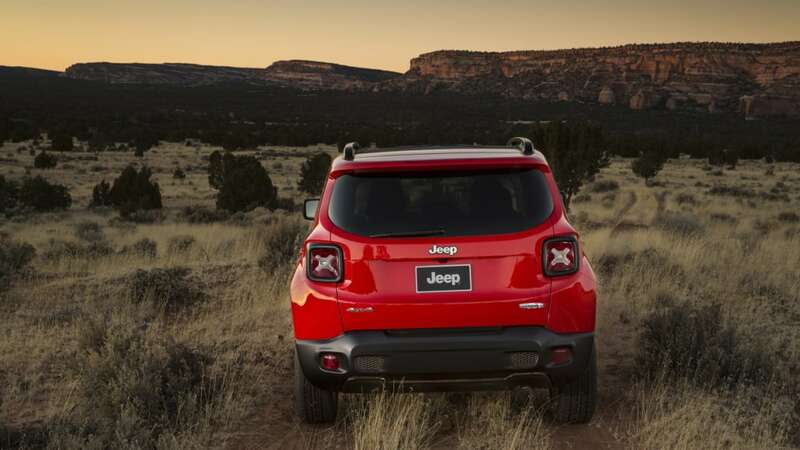 Designed in America and crafted in Italy, the 2015 Renegade continues the Jeep brand's dedication to the global marketplace and demonstrates the depths of its available resources. 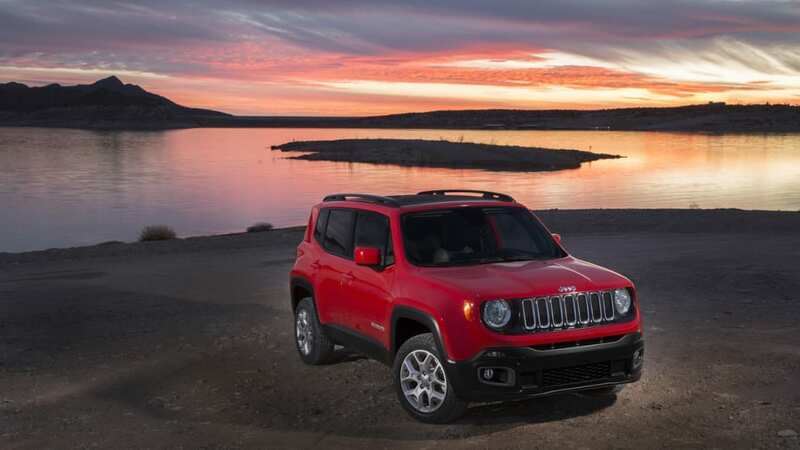 The final assembly location for the Renegade will be at the Melfi Assembly Plant. 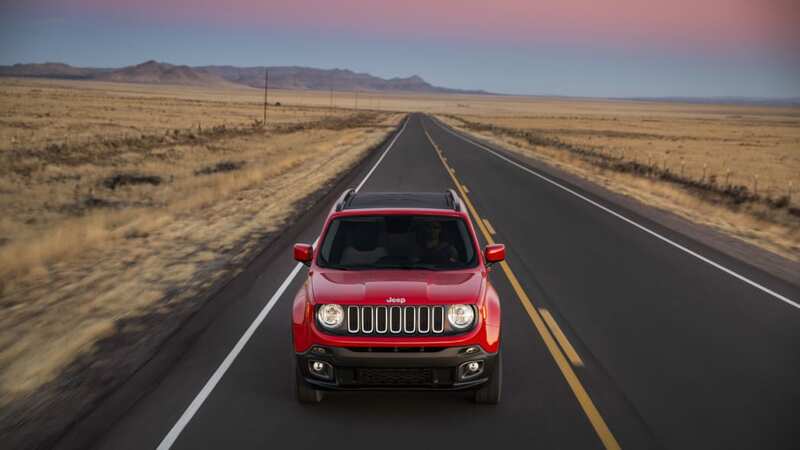 The Renegade's global portfolio of powertrain production includes the United States, Italy and Brazil.